•Reset the tabbed button to its initial selection state using menuHistory. Create a new LiveCode stack; name it and save it. You should now have a stack consisting of a single card. Create a tabbed button control for your new stack by dragging it to your stack; you should see a three tabbed button on your stack in which the tabs are assigned the generic names of Tab 1, Tab 2, and Tab 3. Now we'll learn how to both add tabs as well as rename the text that appears on each tab. 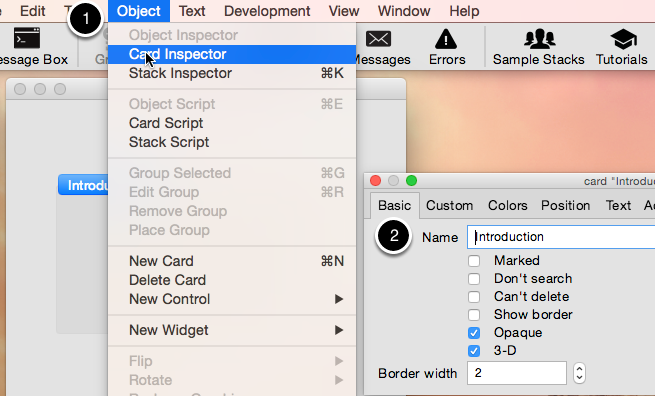 To add tabs (as well as change their text), open the Property inspector from the menu Object -> Object Inspector. 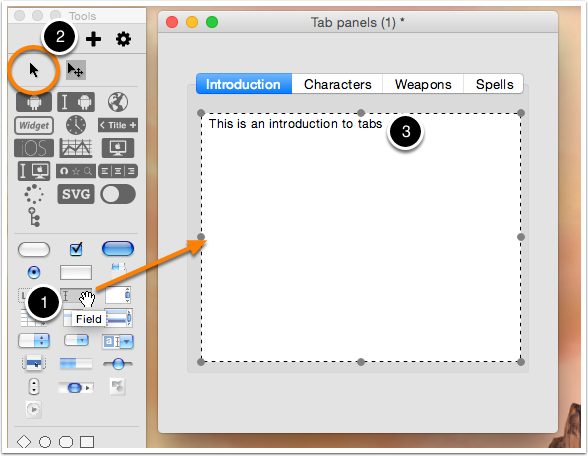 Here you can name the tab panel (1), change the default text for the tabs (2) as well as add additional tabs. 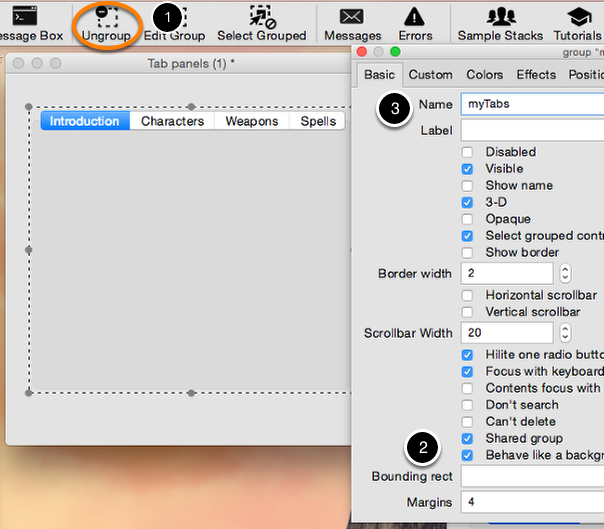 To follow along in recreating the sample stack, rename Tabs 1, 2 & 3 to "Introduction", "Characters" and "Weapons" and add a fourth tab, "Spells". You may want to resize the tab panel to accommodate all the tabs. You can do this from the "Position" tab in the Property Inspector for the object. Click on "Fit content" next to Width, and you should see all your tabs. At this point, a brief discussion on the potential uses of a tabbed button may be in order. A tabbed button can be used in LiveCode to either navigate between panes (or cards) or to change the information displayed on a single card (by using the hide and show commands). We'll start by demonstrating how to use a tab to navigate between cards (for my example, it will navigate to different cards containing information on the mythical game of MIST). In the above script, the selectedText is the name of the particular tab that the user clicked on. The selectedText is a function, not a property, which means it cannot be set, but instead returns a value. The process of "getting" it places it into the local variable it;. Hence, when the next line commands "go card it" what that really means is 'go card "name of tabbed choice of user"'. In the second example, the selectedLine function obtains the name of the tab that was clicked and sets it as the name of the card to navigate to when the tab is clicked. Wouldn't it be nice to do this just once, instead of doing it on each and every card? To make this possible, we'll create a group of this tab button and give it background behavior so that it will appear on all subsequently-created cards. Select the tab button. Bring up the Property Inspector by right clicking and selecting Property Inspector, or by double clicking on it. Once it has been selected, turn it into a group by clicking on the "group" button in the toolbar (1). You will see the Property Inspector change to an inspector for the group. Now it is time to give it background behavior so that it will appear on all subsequently-created cards in the stack. First, we should give our group some sort of obvious name other than "group ID 1004" (1) and, secondly, we should check the box marked "Behave like a background" (2). This latter action will ensure that all subsequently-created cards will have this tabbed button/control automatically placed upon it. Now we will give a name to this card. Let's name this card identical to that of the first tab, namely, Introduction. To change the name of the current card, perform the menu command Object -> Card Inspector (1) and, from there, change the name of the current, only, first card to Introduction (1). Now we are ready to create the cards that will contain our hypothetical character, weapons and spells information cards. To create an additional three cards (for a total of four: one for each tab), perform the menu command Object -> New Card; do this a total of three times. When you have finished, your stack will display card 4 (all of which should contain your tab button!). Here we will repeat instruction #6 above for each card to create a correlation between the tabs themselves and the cards to which they navigate. While we could just use a go to card 1 etc. or a go to card id 1002, it is often easier to simply rename each of the cards so that the name will match (or, at least, be named with an obviously correlating name!). Give each of your four cards the same name as the corresponding text in the tab button tabs (so, in my case, card 1 = "Introduction", card 2 = "Characters" and so on). Go to Card 1. You can use the View menu to do this, choose "Go First". 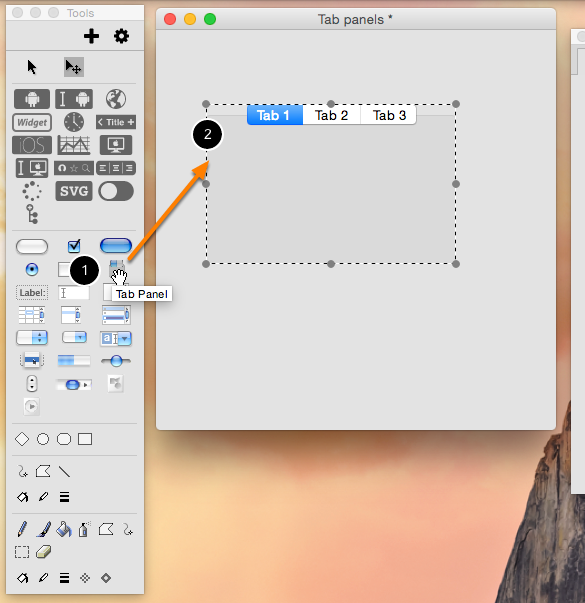 Drag a field out onto your tabbed button (1), resize it to an appropriate size, and switch to run mode (2). Enter some text in the field, such as "this is an introduction"(3). Repeat for cards 2, 3 and 4. Switch to Run mode and try it out! You should see the tab content switch as you click on the headings. The previous instructions demonstrated how to use a tabbed button control to navigate between cards to show content. This section will demonstrate how to use a tabbed control on a single card to hide/show appropriate content. This will open your new substack when you/the user clicks on the button on Card 4. Now switch to your new substack and create a tabbed control there (see instruction #2 above). Create two or more groups of objects (such as radio buttons or checkbox buttons or images or text fields) and give those groups names that correspond to the two or more tabs you created for this stack. Since this stack will use the tab button to hide and show groups of content on a single card (as opposed to navigating to particular cards in a stack), we won't need to group the tabbed button control. The above is for the mainStack you created for this lesson; substitute the appropriate button name for your subStack. Prev: How do I create a scalable UI using graphics? This lesson was very helpful, thank you! Well Judy, you sure spend a good amount of time trying to prepare these tutorials...Thats nice work....Thumbs up to you. Yes, in this case replace the pre-populated menuPick handler with the mouseUp handler given in the lesson. An on menuPick handler is often used with tab buttons which is why it is automatically inserted but this example uses mouseUp instead. Thanks for the prompt responce Elanor, will look at the link right away. How can I add a tab to my tab button (and also add a corresponding card)? How do I delete a tab (and also delete its card)? Update this field, change the names of the tabs and add new ones here. You will need to use on line for each new tab. This inserts the tab for you. You can remove a tab again by removing a line from the field. You add a new card by following steps 6, 7 and 8 under "Creating the appropriately-named Cards". Ensure that the new card has the same name as the tab. You can delete a card by opening the Application Browser (Tools -> Application Browser). Expand your application in the left window to show the cards that make up your application. Right click the card you want to delete and select "Delete Card". you would get this error if you missed out the steps in section: "Giving the Tabs a Background Behaviour as a Group of One". In this section you create a group and give it the name "myTabs". I have the tab menu working except for one key detail. It navigates fine between 3 cards, but the control often highlights the wrong tab after arriving on the card. A click on tab Edit goes to card "Edit" but sometimes leaves tab "Play" as the highlighted (foremost) tab. Do I need to set these manually? that is strange. Did you try the sample stack that is attached to this lesson? This should give you an idea of how the tabs work and how they are handled. This message usually means that you are referring to a control that doesn't exist, so where you are referring to a button called "Tab Menu" there isn't a button called "Tab Menu". Check the names of your controls and make sure they match the controls you refer to in your script. yes this tutorial should work for LiveCode 6.1. Can you elaborate in particular what you are having issues with? Can it be that messages like preOpenCard, openCard, preOpenStack and the like are not executed in the development environment? But only in any standalone app? These messages are sent in the development environment and standalones, however it is possible to turn off these messages in the development environment by clicking the Lock Messages button in the menubar, it is worth checking this is not switched on. Hi everybody, thanks for the tips so far. I have a problem when adding fields to the tabs. How can i bind a text field or button ta a specific tab. I want to be able to click through my tabs, with them showing those buttons and field i assigned to it. When I do it like in the tutorial the field just stays on top of the tabs and doesn´t change at all. Also, if I want to have more tabs, they dont all fit in a row and some are cut off and dont fit in the stack. Is it possible scroll through them? Thanks in advance for helping me with this one. Hi EL_C, if you are using the groups method you will need to ensure that any controls you create are part of the relevant group. New controls are created on the card and not as part of any particular group. This will allow you to add controls to an existing group. You can also cut and paste existing controls into groups in a similar way. I'm now able to connect Buttons and text to the respective Tab from the Tab Menu. However what I couldn't do so far is having a buttan that changes the Tab that is opend. I can click the tabs to switch them but I also want to have a button on each tab that does the same. Something like "go to the next tab". This is what I have as scribt for the Button. 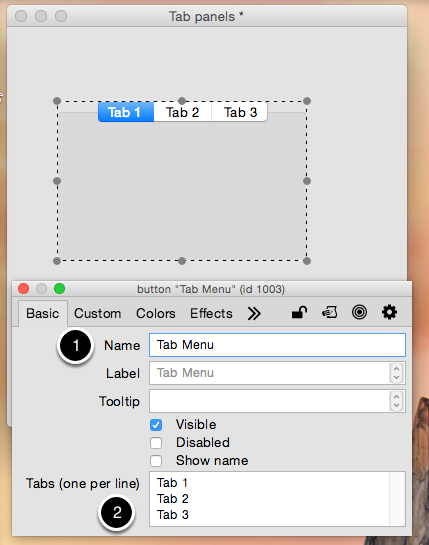 set tab of "Tab Menu" to "Tab 2"
also tried both with: set "Tab Menu" to "Tab 2"
and tried only having either the group or the button scrbt empty. Doesn't work unfortunatly. Any Ideas?